Extends your software’s features to Salesforce.com or implement similar features on multiple instances. We develop powerful business-centric Salesforce AppExchange® Apps. Salesforce® has 150000+ enterprise level users. Almost all of them use apps. Gain a competitive edge by extending your services and product offerings to Salesforce®. Easily add custom features to all Salesforce® instances without doing repetitive customization on all. Appexchange® has paid apps also that gives business an opportunity to earn money. 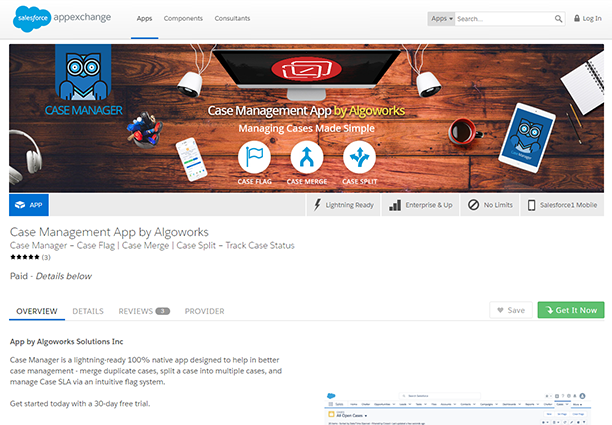 We here at Algoworks have been developing un-managed and managed packaged apps since our inception. We have built custom apps for enterprises looking to add custom features to their multiple SFDC instances, and have built powerful paid apps for Independent Software Vendors aiming to extend their business offerings to Salesforce® users. We have mastered Salesforce Lightning™ and Salesforce Lightning™ Components to build Salesforce1™ mobile platforms compatible and Salesforce Lightning-ready Salesforce Appexchange® apps. We are experts in getting apps approved on AppExchange®. We are certified Salesforce Cloud Alliance Partners. Software makers can get a competitive edge through Salesforce AppExchange® app. Our experts can tell you how! From implementation to customization, we are all-round Salesforce® experts. Here are our core services around Salesforce AppExchange®. We help organizations develop and implement complete Salesforce AppExchange® roadmap. From design and development to deployment , we provide end-to-end AppExchange® app development services. Having trouble publishing app on AppExchange®? Our experience and expertise will come to rescue. We will make your existing apps Salesforce1™ and Lightning™ compatible. 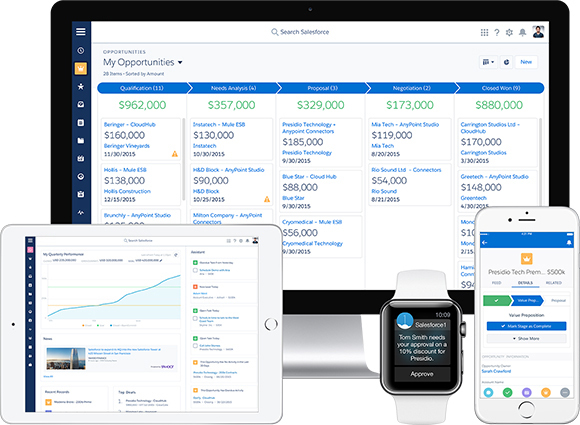 Lightning™ experience, the latest UI change in Salesforce® has opened more possibilities to seamlessly and beautifully integrate your apps with Salesforce® orgs. The catch, your apps has to be Lightning ready. But don’t worry, we can help. 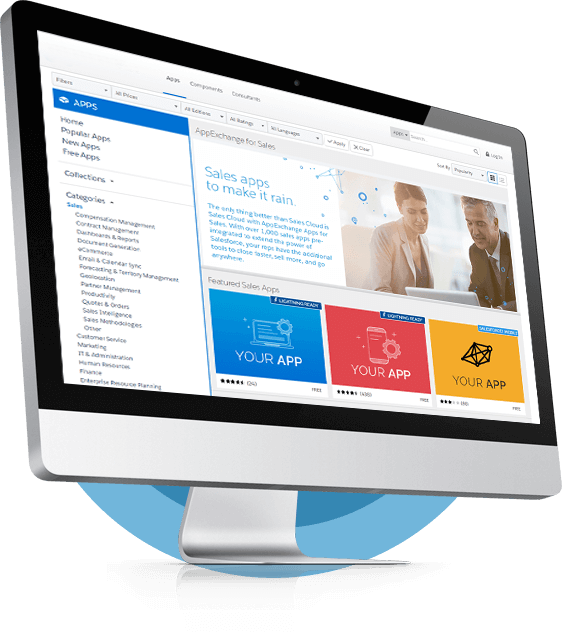 We develop seamless Lightning™ Ready Salesforce AppExchange® Apps. 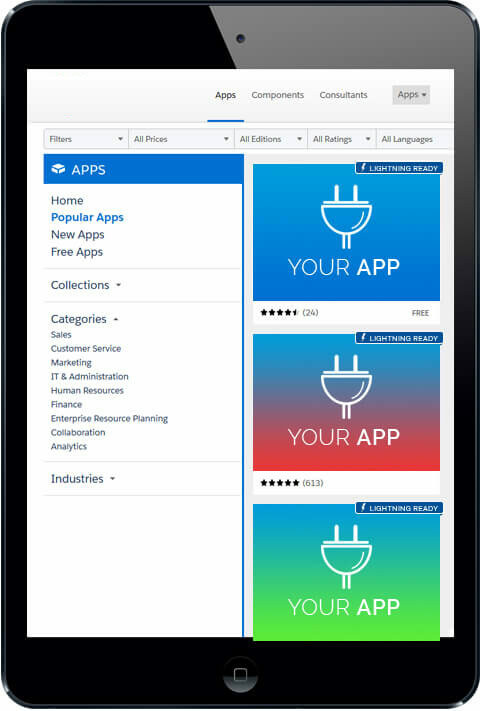 We are experts in AppExchange® app development using Lightning Components and Lightning™ App Builder. We offer special services for creating Lightning™ Connect based Lightning™ ready custom integration apps. Salesforce1™, the awesome Salesforce.com platform that brought SFDC instances to mobile devices, is growing in popularity at exponential rate. Your app should be compatible with the platform or else you will lack behind. 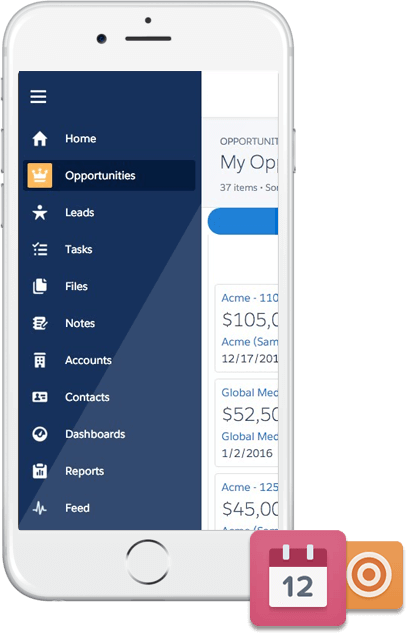 We develop Salesforce1™ Compatible apps that work seamlessly on mobile and desktop. We help organizations customize the Salesforce1™ app to match the branding of their company. We automate your Salesforce1™ app based business processes using custom built apps. 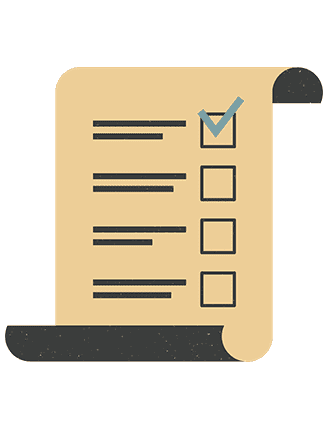 Check out below a collection of our beneficial Salesforce applications. that feature in Salesforce AppExchange. 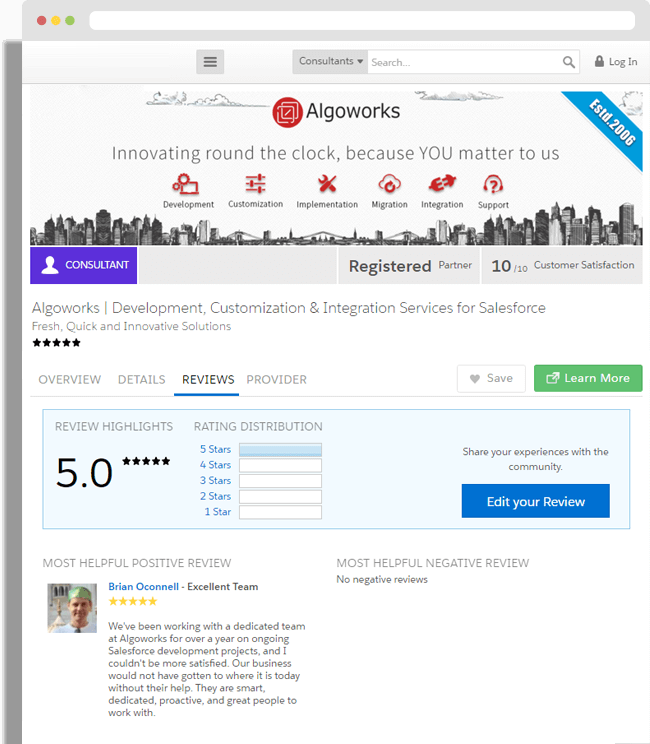 Algoworks Opportunity Manager is a native Salesforce.com application aimed at transforming the way Salesforce® users interact with Opportunity related workflows. The app has an intuitive design and makes the process of handling opportunities very user-friendly. The App’s unique pipeline view, pagination view, and summary charts truly makes the management of Opportunities easier, faster, and smarter. 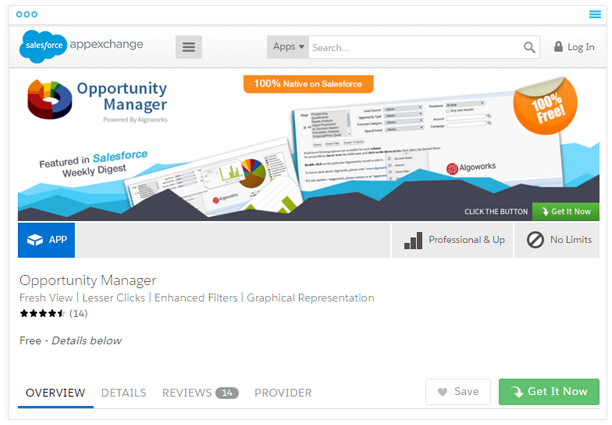 The app was featured by Salesforce.com, has multiple positive reviews on Appexchange® and enjoys a 4.7/5 overall rating on AppExchange®. The App is free to install and use. A Lightning ready and 100% native app, Case management app is designed to help users with better Case management. The app offers to merge duplicate Cases, and split a Case into various Cases. It also helps to manage Case SLA through an intuitive flag system. It intends to make managing Cases easily for the users. The Case management app is featured on AppExchange, with a rating of 5 out of 5, and a bunch of positive reviews. Task Manager is a Force.com app. This native app empowers user to never skip a task, and provides the advantage to managers to set deadlines on tasks and segregate them priority-wise. It also allows users to view tables in a single shot. 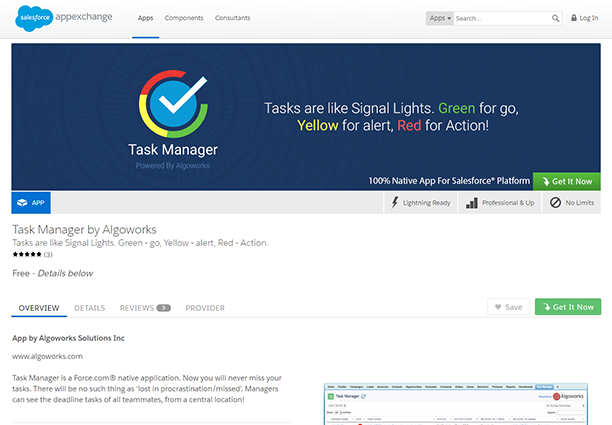 The Task Manager app enjoys a whopping review of 5 out of 5 on AppExchange, along with some positive reviews from the users.